Summer is almost here and I want to celebrate with a stylish pair of new sunglasses. I recently visited 39DollarGlasses.com and shopped their huge selection of Discount Glasses until I found the perfect pair for myself. I have to admit, it was a little intimidating to order a pair of sunglasses online without trying them on in person. However, there is no need to worry because the 39DollarGlasses.com website has several convenient features to help you figure out which style will suit your face. There is the option to see the glasses on real photos of people in the “SmartFit” face shapes tool and there is also the option to print out the actual picture of the frames. Plus, with the 39DollarGlasses.com Worry Free Guarantee, I knew I could return the glasses free of charge if I received them and wasn’t satisfied for any reason. I had a wonderfully easy experience placing my order with 39DollarGlasses.com. There are so many frame styles and options for both regular glasses and sunglasses, but I knew I wanted to shop the Plastic Sunglasses category. I used the SmartFit face shapes tool to see how the different sunglasses fit people with face shapes similar to my own. Once I had settled on the frame style, I went on to select the frame color options and tint options. Since I wanted sunglasses, I chose that as the corresponding tint option. If I had had an eyeglass prescription, I could have easily made these into prescription sunglasses, but since I do not, I made a super cute pair of nonprescription sunglasses. My order was placed and shipped almost immediately – thanks to 39DollarGlasses.com and their excellent customer service. 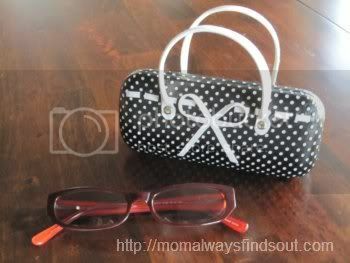 Here are the trendy, high-quality sunglasses I received from 39DollarGlasses.com, along with the absolute cutest carrying case EVER! It’s like a little mini-purse with sweet polka dots. I absolutely had to have it once I saw it on their site. All Mom Always Finds Out Readers will receive a 10% discount at 39DollarGlasses.com by using the code MAFO22 on their order. 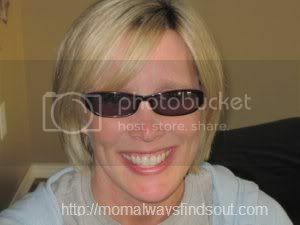 Here is me, styling in the “Somerset” frames in the “Wine/Rose” color option with sunglasses tint. By the way, all glasses come with 100% UV protection and a Scratch Resistant coating. I definitely recommend 39DollarGlasses.com to anyone (this includes Men, Women, and Children) who wants high quality glasses for up to 70% off of retail prices. GIVEAWAY! ENTER TO WIN a FREE PAIR of prescription sunglasses or glasses (up to $75 value, there is also the option to make nonprescription glasses like I did). Contest is open to USA and Canada residents and will end June 19 at 11:59pm PST. A random winner will be chosen by WP plugin “And the Winner Is” and emailed with 48 hours to respond and claim their prize. Disclaimer: I received a free pair of sunglasses in exchange for this review. All opinions expressed are honest and my own, based on my personal experiences with 39DollarGlasses.com and their products. Sponsor is responsible for prize fulfillment. My husband just started looking at getting some new glasses and he needs them! Terry Macri and Mom Always Finds Out shared a link. I like 39DollarGlasses.com on Facebook. I liked $39Glassed on Facebook! I follow Mom Always Finds out via Twitter. I follow Mom Always Finds out via GFC. I liked Mom Always FInds out on Facebook. I like 39 Dollar Glasses on FB. I like 39DollarGlasses on FB! Thanks for the giveaway! I liked 39DollarGlasses on FB as Curtis Martin. I like you on GFC as nchcoloh. I liked 39 DG on facebook. I like MAFO on Facebook. I subscribe to MAFO on email. Following Mom Always Finds Out on Twitter @hle123.